Exfoliate your hands. Once a week, every week. Hands show age faster than crow’s feet do. Like your face and the rest of your body, hands develop layers of dead skin cells and can quickly get dull, blotchy, and rough. 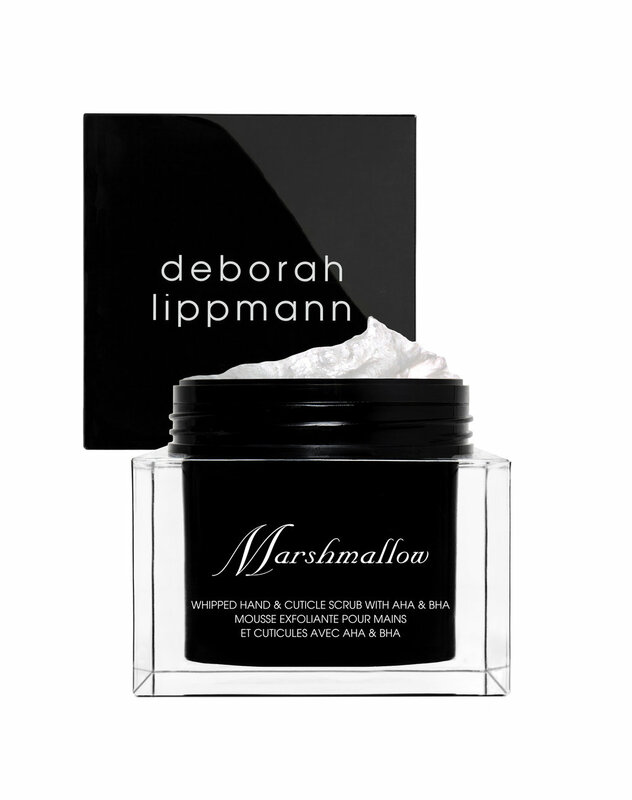 Enter Deborah Lippmann Marshmallow Whipped Hand & Cuticle Scrub with AHA & BHA ($29). Everybody loves Deborah Lippmann for all things hands and nails, of course. And this new addition to her impressive collection is stellar. First of all, the container. An elegant, cool plexiglas black and clear box that is to die for in your bathroom. (You won’t want to hide it but I would because do you really want other people using your Marshmallow?). Open it and inhale a marshmallow soufflé, all whipped and creamy and decadent. See? You’re already in a better mood. Apply to dry or damp hands and massage in all over, including cuticles. Take your time. Rinse off with lukewarm water, pat your freshly fabulous hands dry, and immediately apply a rich hand cream. You’ll love this Marshmallow. You’ll look forward to this Marshmallow. This Marshmallow smells and feels like poetry. Its intelligent ingredients. A combo platter of AHA and BHA fruit and plant acids along with Perlite -- a biodegradable volcanic ash -- lift those foggy dead skin cells and clear those cloggy pores. Meanwhile, marshmallow root extract cools, soothes, and calms irritated skin, and glycerin and coconut oil deeply moisturize. I mean, deeply. I mean, your hands will still be as smooth and soft 24 hours later. It’s as if the young hand fairy herself kissed them all over for New Year’s luck, pluck, and beauty.